Clinging to something that is already lost is a fascinating turn for a story to take, especially when the characters involved are fighting until the very end to gain back that control that is slipping away from them. "The Warriors Will," written by Shawna Benson and Julie Benson, was an episode coated in blood and surrounded by fire. It was the perfect way to explore how an addiction can drive a story or in this case the characters within the story. The need to keep a bad presence in their lives was a recurring pattern, spanning across multiple arcs and the resulting consequences that came from them. It was explored in a way that directly mirrored the suffering that went on because of these addictions, not just for the person addicted but for those around them. Octavia, Madi, and Abby all similarly battled something that was bigger than all of them, and that was able to bring them the harm that they wouldn't allow themselves to lose. It was complicated because the immediate reaction was to want to save them from getting in too deep. But for some, they already reached that line and then some. During The 100 Season 5 Episode 10, Abby's story was the truest example of that, her struggling under the weight of want to the point where utter chaos wasn't going to faze her. Maybe it is because this is something she has seen before; something that pushed her trying to escape that horror at the bottom of the pill bottle even. Or maybe this was truly the manifestation of the darkness that has swallowed her whole. At the same time, Octavia found herself at her breaking point when she tried to keep Bellamy alive. Unfortunately, her addiction to that leadership role mixed in with Bellamy's refusal to play by those exact roles led Octavia to stop at nothing to keep her throne. It was figurative though, considering Octavia and the others are now marching, and there is no bunker to own anymore. But the power balance is clear, with Octavia still calling the shoots by taking away any other choice the others may have had. "The Warriors Will" ventured into a chaotic journey of want, with pain the second factor in a story focused on debilitating desperation. Trying to keep holding onto the control in someone's life prevented them from seeing the complete destruction that they were caused others. It is an interesting shift from the emotional separation that many experienced just a few hours before. Octavia's addiction to the control that she has gotten a grip on over the past six years was almost deafening. As quickly as she realized that she couldn't let Bellamy die, she replaced that with exactly the attitude that had her going as the Red Queen for so long down there. It was when she shared that scene with Monty and Harper that Octavia ironically highlighted the role she carved out for herself. Using Adam and Eve as an insult backfired when Octavia's role as the snake hit a little too close to home. Her position of keeping Wonkru safe has now become an addiction to the power that she gained, and she isn't letting it go any time soon. The fact that Monty presented her with a solution to their trouble with marching to war because the bunker isn't a proper home, that came straight out of The 100 Season 5 Episode 10 Preview. The farmers won’t save the world, Monty. The warriors will. Permalink: The farmers won’t save the world, Monty. The warriors will. It is abundantly obvious that Octavia is fighting this out of fear, with The Dark Year and its unexpected catastrophic decisions making the idea of counting on a farm too risky. But that isn't it, not by a long shot. As a leader looking out for her people, the most basic decision that should have been made is to give Wonkru a choice. Using The Dark Year as a case for why they should follow her would make sense, but removing all possible options that they had was more selfish than anything else. This new position that Octavia has found herself in though is fascinating, mostly because of the way that being a villain suits her story. For so long Octavia made choices that were by no merit right or ethical, but there was no accountability as she continued along the road of a heavily flawed core character. Now everything that Octavia has been through was set up as a backbone for her role as a leader, one that struggled just as much if not more than the people she questioned for a long time throughout the seasons. Being a leader isn't easy, and Octavia digs deeper into that by showing how that can become a need more than anything. Octavia may have struggled just to keep her people alive, but along the way, she found a place that she is unwilling to step away from now. This is where Octavia belongs in her mind, which means that those around her are now paying the price in a way. Setting Monty's farm on fire was the last straw for a person who got and will continue to be offered chances that she doesn't want to get. Even with Bellamy about to die at the hands of Octavia's leadership, he was still offering to metaphorically and even literally cut himself open for her. The sacrifices that are made have run out, with Octavia putting everyone into a place of no return, but that doesn't mean that she is getting redeemed from it. And in a way, does she even want to be? Octavia is surrounded by people who want better for her; people who know there is better for her out there. Yet at every turn, she proves just how little that hope for her matters, especially when she herself has carved out the best version of what she wants to have. This control is her addiction, so as much as others may think offering her other choices will change something, it won't until she wants it to change. This time around her motivations were made clear in a way that they might not have been before. That fire was a manifestation of the chaos that she is willing to create so that her people will follow her, and follow her they did. Moving forward, Octavia marching to war is a recipe for a disaster that she seems to embrace in a way that others won't. For now, she is followed because she is their only choice. But while oxymorons are a wonderful theme for The 100, this isn't the end of their story. Octavia will have to face what she took away from everyone, if only because she has decided on her own to be an enemy of Wonkru. Choosing not to give them a less dangerous option for survival was in direct opposition to everything that she took six years to build, she went against her own word and became the common enemy that she had to create to make sure everyone survived. There is a reason why the flame keeps being denied the attention it seems to want this season; it is because the arc still feels like an attempt to explore something that passed its prime. The flame isn't a bad plot, but room to explore it was made explicitly in The 100 Season 3 with Lexa's death pushing it to the forefront. Bringing it back around now, after a six-year time jump, it comes off as redundant in a worrisome way. That is where the addiction to this flame comes in -- not from Clarke but Madi. Although, it needs to be mentioned that Clarke's entire motivation that left Bellamy in danger came from her wanting to protect Madi from any harm. Isn't letting Madi keep the flame, something that is giving her constant pain and horrible dreams, counterproductive with the way that it is harming her? Clarke had the right idea at first, wishing to take away something that weighs on Madi in a way that it shouldn't. She is turning colder, with this now becoming a recurring problem for Madi's state of mind moving forward. And yet, Clarke lets Madi cling to this thing that she is addicted to dangerously even though it goes against all the ideals that she has been pushing within the narrative. As for Madi, she can't be faulted for the way that she is drawn to this flame. First of all, she is young and impressionable, so the appeal of the flame was always going to be there. All her life she has been told no when it came to the idea of being a Commander, so obviously, this would be something that she wants like nothing else. There is also the fact that these spirits or technologically modified parts of previous Commanders are reaching out to Madi, and there is no way she can shy away from that. They are in her dreams, with a sequence from Becca giving us the preview of what it means to have the flame, and that is a hold that not even Clarke can break with words. Madi is stuck now, addicted to the possibilities and the rush that comes from leading. But being addicted means wanting something more than anything else, and Madi is very far from the place that she feels she needs to be as Commander. We should use something as leverage so she doesn't attack. It’s how Bellamy saved you the moment he got back to the ground. And got the bunker open. I mean, by now, he is probably dead. Eventually, that call to do something will become too strong, which is probably where this flame will come in. If this all isn't an attempt for Madi to get information that will carry them over into their next big twist for Season 6, then there will be a real problem with the flame coming up in the narrative this strongly again. It still feels like progress could have been made without a plot device from two years ago, but it is what it is now. Not exploring this scenario in the pits to a full dark extent was the best possible decision that this episode and even this season may have made. The doom and gloom are dripping from every corner; there is plenty of angst and bone-chilling darkness to be found if so desired. That is why allowing this plot to serve what it did regarding Octavia's character while still leaving room for some hope was the right decision. There was too much worry about Bellamy, Indra, and Gaia having to fight each other at the command of Octavia and the disastrous results that could follow because of it. 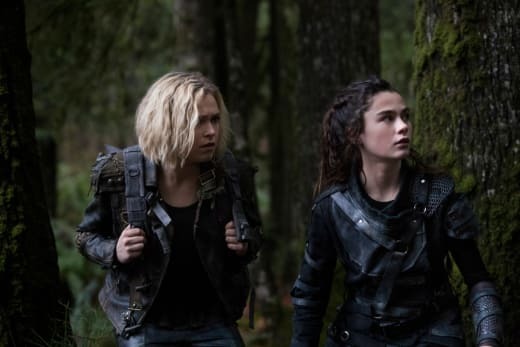 By subverting the expectations that an episode like The 100 Season 4 Episode 10 created, The 100 kept the idea of high stakes up in the area and yet allowed some room for some happiness. Bellamy: If you do this, there is no coming back. Octavia: I know you're still trying to save me, Bell. But you can't save someone who's already dead. Permalink: I know you're still trying to save me, Bell. But you can't save someone who's already dead. Monty barging into that room with his flower was the flicker of light, providing faith at a time when many were lost about what their future would hold. It was beautiful in the way that it was so completely pure. Still, there were some intense fighting moments between Bellamy and Indra before the fact, the ones that then became complete respect and a nice friendship that both characters need considering what they have been through lately. At the same time, Gaia opting for a call back to Queen Nia's death was the perfect level of shocking, while also drawing back into the past as Season 5 has continued to do. While this was a failed attempt, the shock that came from it can't be downplayed. This came from a person that until then showed no true strategy and had the biggest target on her back. Not losing Gaia was one of the highlights of "The Warriors Will," and it gave her some epic scenes without clouding that in sadness or worry. Overall, the fighting pits proved to be successful not because of the result but because of the way they exceeded the expectations they were playing directly into at first. There were these points when Octavia was almost the one that everyone was looking to save the day, but she used that time to prove why she shouldn't be the person that is continued for these twists anymore. Instead, the hero of all this was Monty and the hope that he brought with him for a survival plan that didn't involve violence and death. Now that is something to believe. This corner was really small, as was Madi's patience for Clarke's decision in The 100 Season 5 Episode 9 when she left Polis without much thought. Clarke couldn't avoid everything she was trying not to look back at, with a sharp comment about Bellamy probably being dead as the perfect plunge into her subconscious. It may be subtle with Clarke not having to face her decision yet, that will stay exactly in the same place as always. But the moment that Clarke has to face Bellamy, the flames better be stronger than when Octavia burned all of Monty's hard work down. 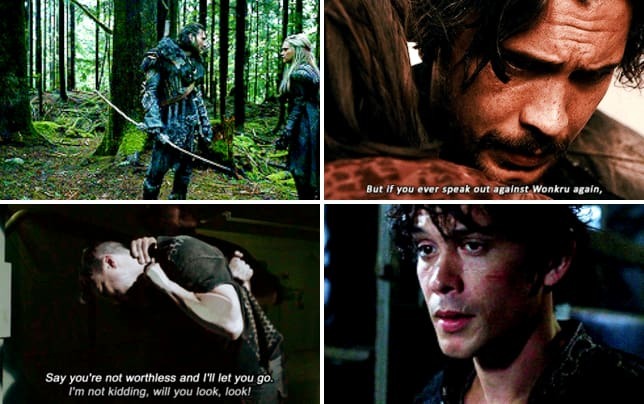 There was also that nicely added parallel, with Bellamy lying down during his imprisonment and the way that it mirrored Clarke's recovery as she waited for Bellamy to come to see her in The 100 Season 5 Episode 4. These may be split seconds things, but yet somehow this was a nice buffer after the heartache that was Bellamy and Clarke's last moments together. Their relationship is nothing if not a rollercoaster, and this walk to the next ride still felt some version of pleasant. Madi mentioning Bellamy every few hours is too relatable. 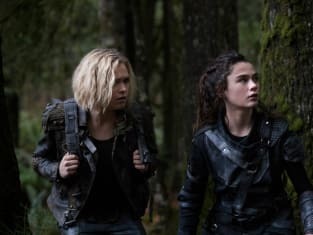 It is also my favorite new development from Clarke's stories because of course, she would make Madi care about Bellamy this much. I missed Raven Reyes more than words could even describe. As always, her absence is really felt. What is Octavia's skin care routine? Going days on end with her own blood on her face can't be good and yet she still looks good all the time? Is that some side effect of the rations? There are only so many times that Octavia and the others can skirt around the fact that they ate people. Based on the trailer for next week there was probably more to it than that, and yet even the idea of eating people is enough. Now we just need that confirmed before it feels redundant. The Dark Year is coming. That sequence with Abby struggling for the pills while Vinson gets his own addiction fed was chaotic in all the best ways. I appreciate the way that they explored Vinson's dark side without making it too grotesque or taking away from the Abby part of it all. It may have been horrific, but the focus was the pills, as this was Abby's perspective and the fact that Vinson was a passing thought showed more than enough. Miller's loyalty to Octavia is stronger than ever, and I am really hoping this is all meant to set up a storyline for him in the flashbacks. The time jump used for shock was rare this time around, but out of it came all these questions about Miller that should get answered. Exploring his headspace and how he has become this committed to Octavia would be intense but also very interesting. Bellamy and Harper hugged. All is right in the world and happiness blooms as quickly as Monty's flowers did. Clarke dropping and shattering those worms will not be brought back up again. It will definitely not come back to bite anyone, not at all. What did you think of Octavia's decision? What did you think of Abby's decision? Did you see it coming or were you blown away? What do you see coming next for those two? Where are you on the flame acceptance spectrum? Would you take it out of Madi to keep her out of pain? What would you have done in those fighting pits? Would you have been a Bellamy, an Indra, or a Gaia? How glad are you to see them so friendly now? How much are you waiting for them to drop the c-word already? Who else was shocked that a fire was actually started? Where do they all go from here? How will Monty find faith in a future now? Which part did you love the most? Which part did you like the least? How hard are you shipping the Pilot Mechanic that we didn't see in the episode?